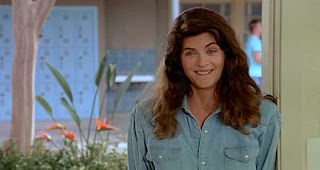 It is rare for one film to capture two actors with a promising career behind them, so the atrocious Summer School is interesting for at least freezing in time the steep career death spiral of both Mark Harmon and Kristie Alley as they made their way from TV superstardom to the bottom of the barrel. There must be a point to making a teenage-oriented movie without wit or humour, but Summer School doesn't find it. Instead we are presented with an icky teacher-student relationship that drips with awkwardness. Even more bothersome is a staged classroom bloodbath that is especially disturbing with the hindsight of real-life classroom violence that has transpired in the intervening years, although there was enough campus violence predating 1987 to seriously question the judgement of director Carl Reiner and scriptwriter Jeff Franklin. The threadbare story involves athletics teacher Harmon forced to babysit a group of loser students through summer school. Harmon only gets interested in actually teaching once his job is threatened, but remains generally more interested in romancing Alley, who is in charge of the classroom next door. The romance never ignites, the students never captivate, and the villain of the piece in the shape of the vice-principal is straight out of cartoon cut-out land. Alley would go on to have an upward blip with Look Who's Talking in 1989 before flaming out, whereas Harmon never translated his TV appeal to the movies and generally fizzled out in a succession of small screen flops. Deservedly, none of the students went on to serious careers in the movies. Summer School achieves the difficult feat of actually being more irritating and a lot more aggravating than attending the real thing.